At last, I've used my powers of flight to make a geologic observation from the air. This is an exciting first to my blog, and I look forward to more of the same. This last weekend I flew down to a Fly-in/Drive-in breakfast and air show that is held every summer in Winona, Minnesota. For the few years I worked, went to school, and learned to fly there, I would volunteer for this event and it was always a thrill. I've missed the last two, on account of being in Missouri for grad school, so it was great to be able to fly there from the Cities. Also, it was nice to get in some cross-country flight time. I took the trusty Cessna 152 I've been hopping around in lately. I learned to fly along the Mississippi River, so it was great to re-visit my roosting grounds. And of course, you can't beat the view. Now, for the geology. On the way back to the Cities I noticed a decent sized quarry down amongst the little stream valleys. 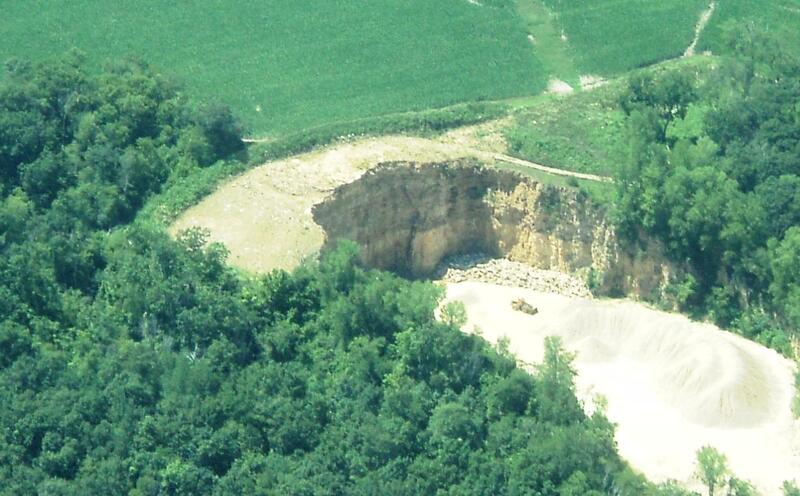 Now, I've seen quarries from the air before, but after looking closer (especially in the photograph), I noticed something obvious: there were two distinct formations in that outcrop; an orange lower unit and a buff-gray upper unit. I think any other place and I would have just dismissed it, but that combination of rock colors in that sequence, and for this region, represents a geologic contact that is well-known to every geologist and geology student in the area. The bottom orange-tinged unit is the Jordan Sandstone, and the upper gray unit is the Oneota Dolomite. The contact is the Cambrian-Ordovician unconformity. All geology students recognize the Jordan Sandstone because it tends to break easily and stains your hands and clothes a rusty-orange. 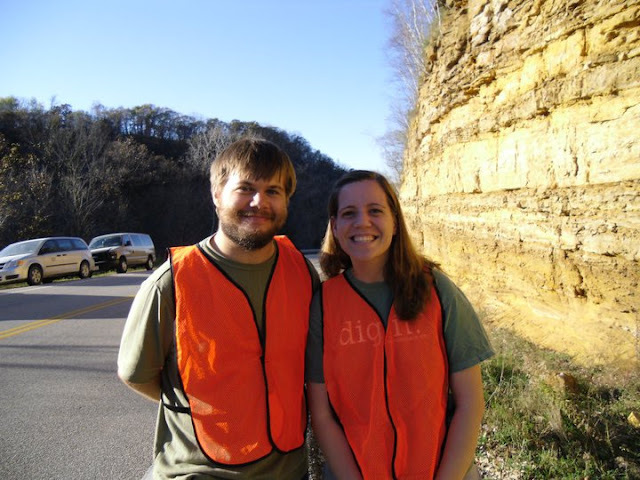 There is a large outcrop of rock that students are brought to which we just call "Homer", and the Jordan Sandstone is part of the sequence of rocks exposed there. 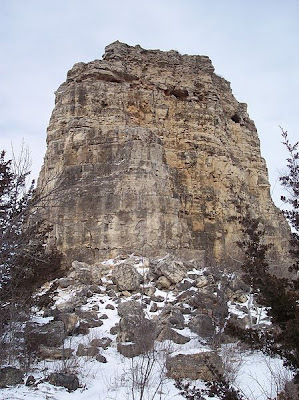 The Oneota Dolomite, above the Jordan Sandstone, is known around the area for making up the resistant caprocks for the bluffs. Around Winona everyone sees this formation all the time as Sugar Loaf, the pinnacle of rock seen from almost anywhere in the city, even at night (they light it up), as a remnant from quarrying.